Did Jesus tell a dying thief that the two of them would be together in Paradise that very day? It seems that one of the two outlaws who were crucified with Jesus must have been converted right there on the cross. “And he said unto Jesus, Lord, remember me when thou comest into thy kingdom” (Luke 23:42). Jesus responded, “Verily I say unto thee, Today shalt thou be with me in paradise” (Luke 23:43). 2. Did the thief go to Paradise that day? 3. Did Jesus go to Paradise that day? 4. If the answer to either question 2 or 3 is “No,” what did Jesus really say to the thief? Let’s get some answers right from the Bible. QUESTION 1: WHERE IS PARADISE? Some people say that Paradise is part of Hades, but the only Paradise the Bible talks about is in a supernatural, heavenly realm where God is. If Jesus and the thief went to Paradise that crucifixion day, they went into the presence of God. QUESTION 2: DID THE THIEF GO TO PARADISE THAT DAY? That day was the Jewish Preparation day (Friday). The next day was the Sabbath. Take a look at this: “The Jews therefore, because it was the preparation, that the bodies should not remain upon the cross on the sabbath day, (for that sabbath day was an high day,) besought Pilate that their legs might be broken, and that they might be taken away” (John 19:31). Do you get the picture? The Jews – more particularly, the religious leaders – wanted the gruesome sight on Golgotha cleaned up before the Sabbath began. Crucifixion was not an instantaneous execution. It was meant as an extended form of torture. The victims on the three crosses could linger on in agony well into the Sabbath hours, which began at sunset. Take them down from the crosses. Leave them to die on some loathsome acre where the sight of their mangled, bloodied bodies and their cries and moans would not distract from the faithful observance of Sabbath. Pilate yielded to the request. He gave the order. Of course, there was no need to break Jesus’ legs. He was already dead. The Roman soldiers made sure of it. But they did break the legs of the two thieves. The sun set. The day was over. Jesus was dead. The converted thief? Was he in Paradise? No. His legs were broken. He suffered on and on. He wasn’t going anywhere. QUESTION 3: DID JESUS GO TO PARADISE THAT DAY? The term “three days and three nights” applies to time in an inclusive sense; the people who heard Jesus would have counted a part of a day as a complete day. “The heart of the earth” is widely understood as referring to the tomb or sepulcher. When Mary Magdalene encountered Jesus after His resurrection, He told her, “Touch me not; for I am not yet ascended to my Father” (John 20:17). He had not yet been in Paradise, in His Father’s presence. He had been in the tomb just as Jonas (Jonah) had been in the belly of the whale. If we take the words of the Bible in their simplest and most straightforward sense, we conclude that neither Jesus nor the thief ended up in Paradise on the day of their crucifixion. If that’s the case, what about my fourth question? QUESTION 4: WHAT DID JESUS REALLY SAY TO THE THIEF? It would be great if we had the original manuscript of Luke. But we don’t. We don’t have an original manuscript of any portion of the Bible. What we DO have is a huge collection of source documents in various forms: scrolls, tablets, plates, and books dating back to ancient times. Our oldest copy of Luke, written on papyrus, comes from approximately 200 AD. Scholars refer to it as Papyrus 75 – or simply P75. What do we learn from this manuscript? First of all, the manuscript is in Greek, where there are only block letters – what we would call uppercase or capital letters. There are no chapter or verse divisions and no spaces between words or even between sentences. There are a few scattered dots between some of the words, but aside from that, manuscript P75 has no punctuation. If the King James Version (KJV) followed the model of that manuscript, it would have Jesus saying, “Verily I say unto thee today shalt thou be with me in paradise.” See? No comma! Truth is, commas do not appear in New Testament manuscripts until many centuries after manuscript P75. The men who first composed the contents of the Bible were inspired by the Holy Spirit. (See 2 Timothy 3:16.) The same cannot be said for the translators and copyists who introduced punctuation. The position of a comma in a sentence was an act of interpretation, not of translation. In the case of Luke 23:43, the comma was inserted by a translator who believed that good people go to Paradise immediately after they die. Let’s get back to our verse. The word “today” is an adverb. It answers the question, “When?” It can apply to either “I say” or “you will be.” In other words, we could read, “I say to you today” or “today you will be . . .” Grammatically speaking, either way is correct. Were it not for the interference of that translator’s comma, we would be left to interpret Jesus’ words for ourselves by prayerfully studying the context and related Bible passages. But the comma is there, in the KJV and most, if not all, other English versions. And that comma determines the role of “today” in the sentence. This phrase, “I say to you today,” matches several similar phrases found in the Greek version of the Old Testament – which was familiar to the Christians of Luke’s day. The bottom line here is that Jesus did not promise the “good” thief that they would be in Paradise together that very day. Jesus died that day, went into the grave and rose on the third day, just as He had predicted. The thief didn’t die that day. 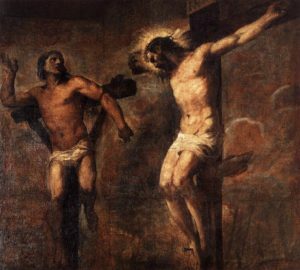 His legs were broken by the Roman soldiers, who took him off his cross before the day ended at sunset. They left him to die a lingering death in a field outside Jerusalem. But he died in the hope of a future resurrection. Somewhere, somehow, this criminal had learned the truth about the second coming of Christ. Maybe he had heard it from Jesus Himself. Maybe he had heard one the disciples preach. Whatever the case, he knew what to ask for as he hung beside Jesus on the cross: “Lord, remember me WHEN THOU COMEST INTO THY KINGDOM” (Luke 23:42 NKJV). There were plenty of other voices, shouting insults at Jesus, mocking Him, cursing Him. But Jesus heard the thief. Their bodies hung deformed and twisted in excruciating pain. It was the worst time of their lives. In fact, it was the darkest hour in the history of the human race. There, in that blackest and bleakest of days, Jesus answered the thief’s plea. If these few paragraphs are catching you at a “down” time – at a time when you are uncertain about your own eternal future – take heart. Jesus is ready, today, to give you the same assurance He gave to the dying thief.